Whenever one wonders where the idea of a garden started, one finds that the Garden of Eden was first realised in Persia and travelled the world woven into prized carpets. That must explain why the gardens in India, from Kashmir to Agra, were created by Muslim invaders. I couldn’t find any Hindu gardens around their sacred trees. 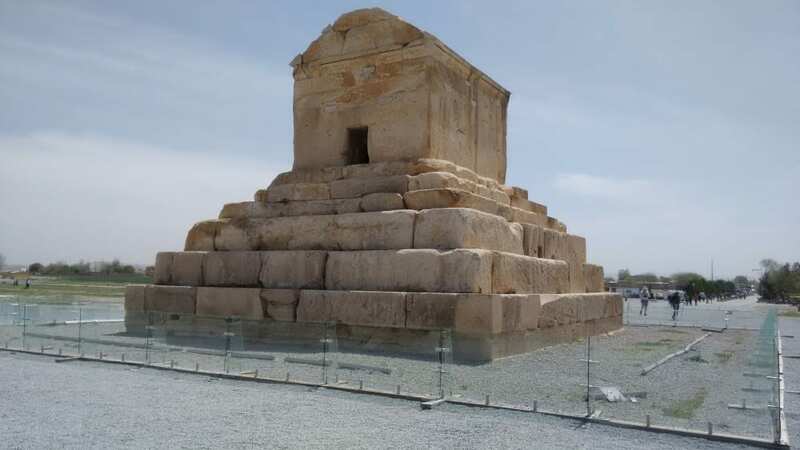 Between Shiraz and Yazd lies Pasargadae where in 550 BC Cyrus the Great defeated the Mede invaders and built a palace. 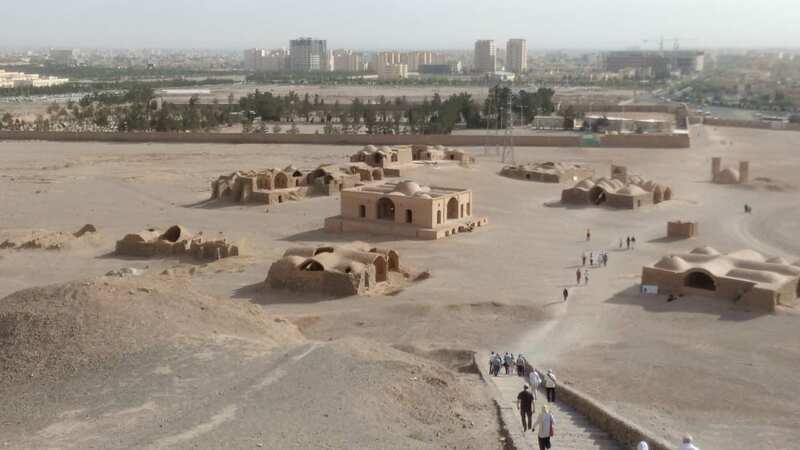 What is claimed to be the world’s oldest extant garden layout is surrounded by the scattered remains of his palace, temples, the welcome gates for visitors and the unexcavated city beyond, all on a wide plain encircled by low mountains – thence the snow in winter and source of water. Nearby, in splendid isolation, stand Cyrus’s white limestone tomb, gabled with a tomb chamber inside. Travellers in later centuries record it standing surrounded by a walled garden with many different types of trees. Traces of corner pavilions remain. We sat on the steps of Cyrus’s palace and looked across the dust-covered stones and slabs, the mind’s eye marvelling at what he might have seen. In 330 BC Alexander the Great – or not so great to Iranians – sacked Persepolis. The city was founded in 520BC by Darius I who created and unified an empire that was to be the longest lasting in the ancient world – some historians claim it was also the most efficiently ruled. Work was continued, mainly by Xerxes, until 460 BC. In the spring of each year the ruler and his court gathered there to receive the tribute of subject nations depicted in relief carvings on the superb staircase. Alexander and his army returned to Greece bringing with them memories of Persian gardens. Some would have been large-scale, like the botanic one we visited in Shiraz, all divided into squares or rectangles by major or minor blue-tiled channels. There wide-leafed lime or plane trees give relief from the midday sun interspersed by cypresses to provide shade in the evening. The smaller gardens follow the same pattern, their flower beds crammed with pansies or petunias which, I suspect, are a more recent fashion to satisfy a demand for instant colour. All are meticulously tidy. About 25 years ago I visited the Gardens of Shalemar in Kashmir. When there I took a photo of a group of Muslim children. One of them asked for a print so when I got home I sent her a copy together with a simple book I had written about Beverley. For the next 25 years we carried on a correspondence. She would send me letters beginning with ‘Dear Respected Aunt’, I would reply telling her about happenings in Beverley. Sometimes during her teenage years she would write that she felt I was the only person who really loved her, when at university she complained that her parents would not let her marry the man she loved. Finally she married, the next letter said ‘it is hard to understand the ways of men’. Her last letter announced the birth of her baby. That was several years ago and I have heard nothing since but I still have happy memories of my time in the gardens of Shalemar and of Meetu, the eight year old girl I met there. What a lovely and moving story. I fear her husband stopped her writing to you. This reminded me of my own visits to Iran, and of laying a rose on the tomb of that great poet Sa’adi. The appreciation of a humanly satisfying landscape – a built environment, a garden setting graduating to a wilderness beyond – in the case of Persia here, mountains, – of has of course many Classical and later European parallels, and all have major value, and are of urgent relevance in an increasingly urbanised world. In fact there is a town in Yorkshire where such values and principles – which badly need to be promoted – are either not known about, or are being shamefully neglected, while the very thing that matters there – that kind of a harmony – of its distinctive town and country equilibrium – is at this very moment being ignorantly, ruthlessly destroyed. Yet, in that town, not without its poetry readers, a determined battle to promote and apply these civilised concepts (how people live in balanced accommodation with nature and the universe is at the heart of what the early Persian poets celebrate) has scarcely been joined. How very, sadly true. It was lovely to see you again, albeit briefly.